The netting is part of what is called minor art, and takes a second place inside the art history, nevertheless its origin goes back to the antiquity and it is related to the art of fishing. In fact, it has been practiced since ever, and has been forerunner of some types of laces, for example knotted laces, as artistic and archaeological testimonies show us. It is also true that they are not always accepted these knotted primitive arts as laces (word that was used then, to call those works inserted among fabrics), considering like such, those carried out from the sixteen century. Both theories have their part of reason. The sixteen century is considered the century of splendor inside the history of the laces, but is also certain that does not seem very logical that the lace could arise with so much perfection in those centuries without there were some antecedents and an evolution. 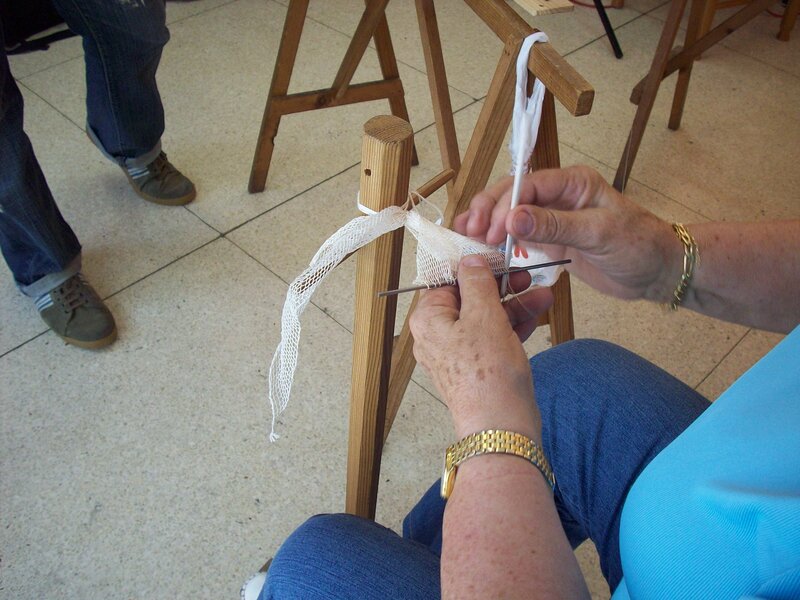 The lace in general consists of going interweaving a series of threads to create a ground and even some fillings. 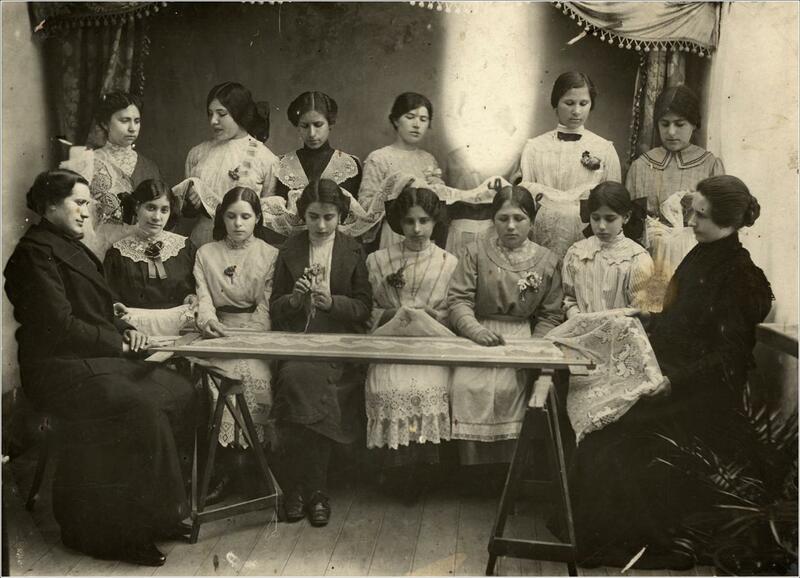 According to the instrument used, the technique will be called needle lace or bobbin lace. 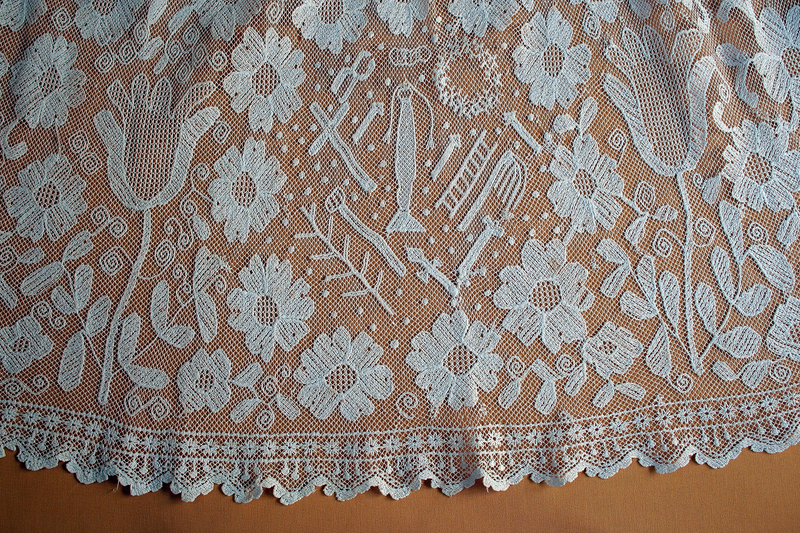 The netting would be included, since a technical point of view, within the group of needle lace as it is executed with a shuttle, and a loom frame. The knot is the classical procedure. The netting is made in two differentiated processes. Tap on the images for a closer view. First is made the network itself with a shuttle. This network is based on knots, which form a square reticle which will be the basis to carry out subsequently the embroidery with a needle. 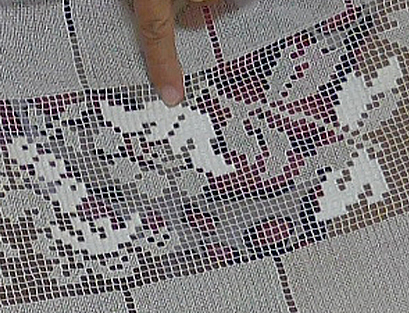 The result of both techniques is called “netting embroidery”, that in its more cultivated version resembles the embroidered tulle. This technique had its development from the fifteen and sixteen centuries and was made not only in Spain but also in Italy, France and Germany. Schuete (1963), considers that in Spain already was done early the Fourteen century as a domestic work. 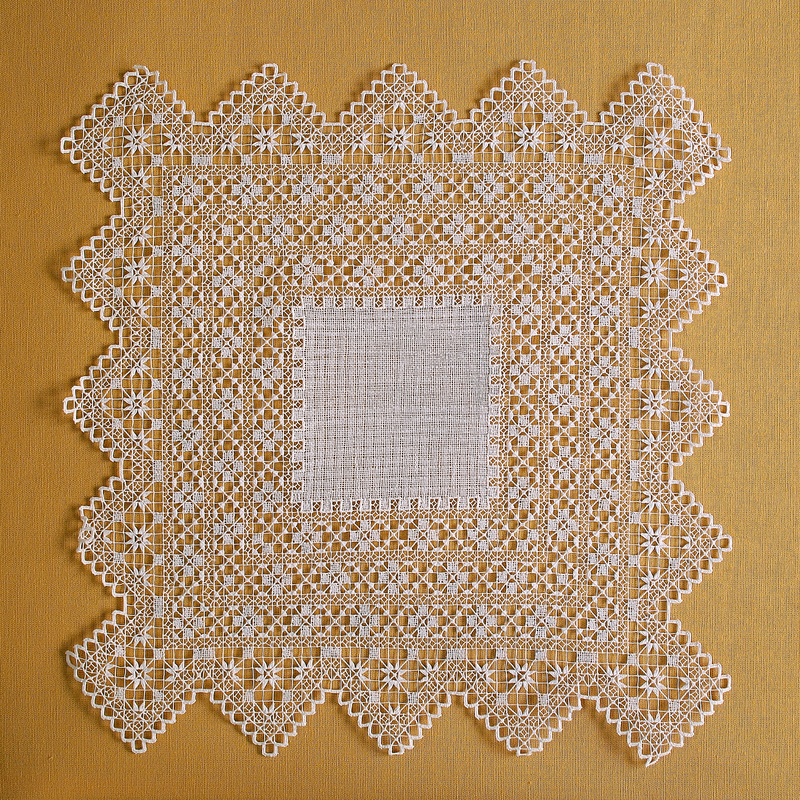 The works of netting were very appreciated during the eighteen century, those dedicated to decorations of white ornaments for altar, domestic textiles: canopies, bedspreads, etc. Was less frequent its use for clothing. 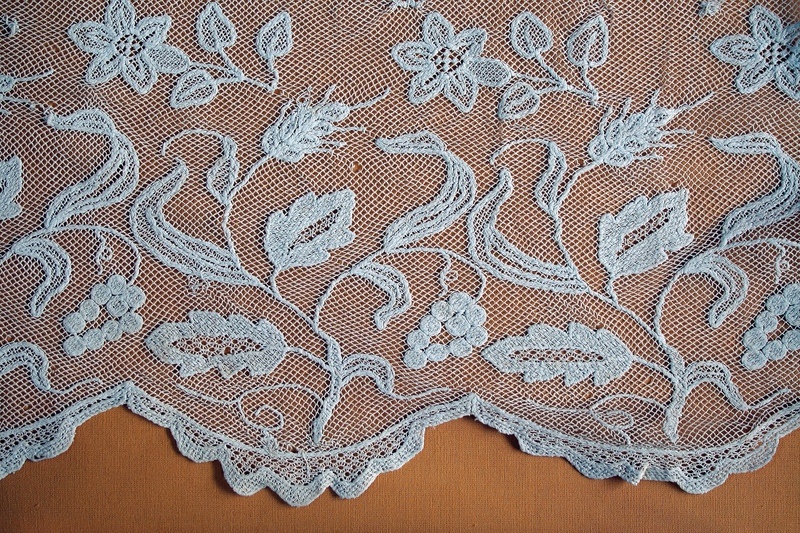 Later seventeen century this technique began to decline, leading to other laces as needle and bobbin lace, worked with very fine threads of silk and linen that were more on line with fashion at that time, however, embroidered net never stopped to be worked. During the nineteen century it recovered again, but at present it lost its refinement and its enlightening, to become more popular. This is due to the replacement of the linen thread by cotton, the reticle of netting is done in a greater size and the figurative decoration evolves toward floral and geometric motives. With respect to the embroidery, they are added new stitches, among them guipures and/or the motives enhanced with a thicker gimp thread. In Spain they are four areas where it emphasizes the elaboration embroidered net, more of them in coast zones except one that develops inside of the country. 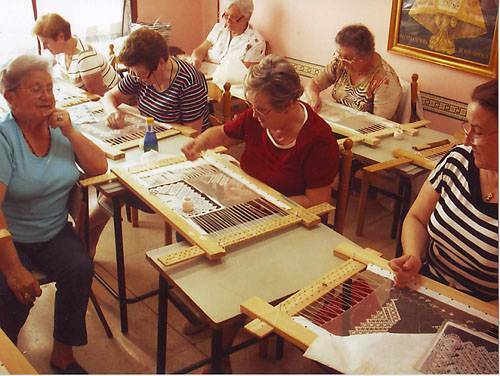 Xátiva is known for carrying out netting of great refinement. In Catalonia this technique results ruder and often combined with other laces of this area. 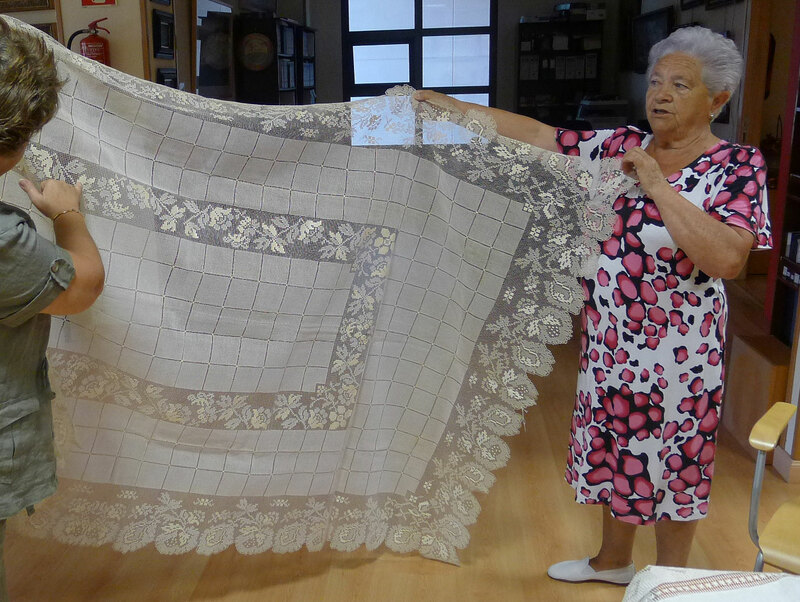 In the mountain region of Huelva the embroidered net has been always carried out combined with another peculiar work: the “cortadillo”. In Luanco, Asturias, the tradition goes back to the epoch in which they arrived at the harbor the whales fishermen. 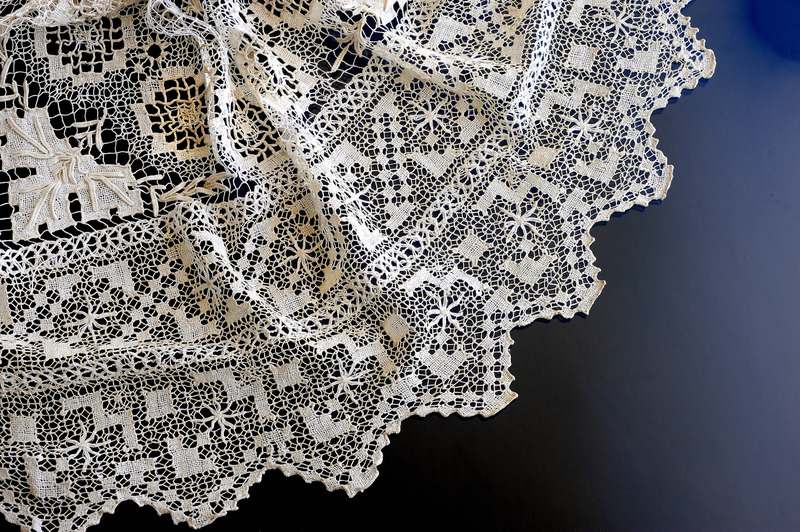 The production of lace was alive until 1960’s, then declined just as happened with other lace techniques, and it was not recovered again until 1980’s. In its reappearance shows a new evolution, gray and white thread and sometimes also polychrome threads are used. They are preserved magnificent pieces from our country, in different foreign and national museums: Pascó`s collection in the Museum of Lyon (France), The Hispanic Society of America (New York). Institute of Valencia de D. Juan (Madrid), or the Museum of Arts and Popular Customs in Seville. Tap to enlarge on the images of the carroussel. 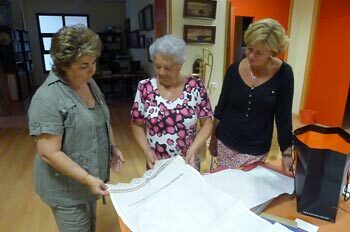 In my visit to the Maritime Museum of Luanco (Asturias) I had the opportunity to meet Pilar Carrasco, documentalist of the Naval Museum, where antique pieces of netting are displayed and Carmen González Gutiérrez “Pirita”, “mallera”. This is the way that netting lacers are called in Spain. 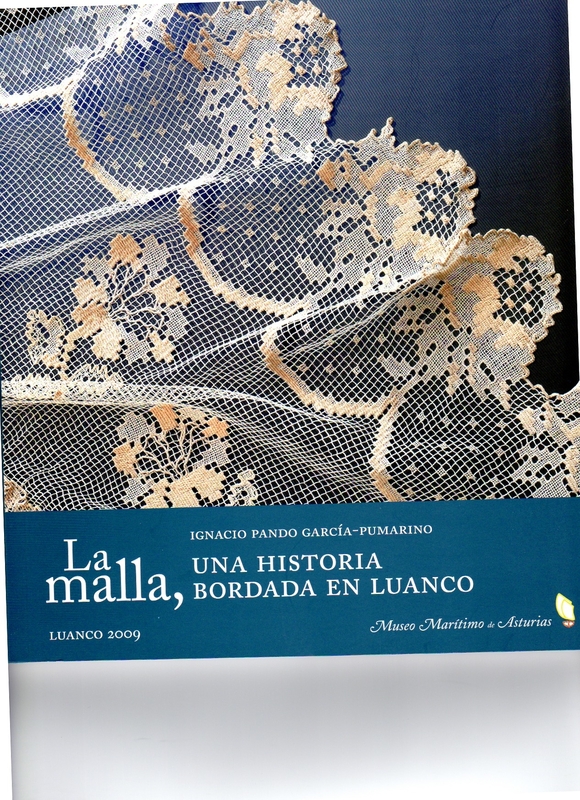 The talk I had with them and the pieces that they kindly showed me, awoke a deep admiration for all those artists and crafts women that never stopped working this lace craft, and the effort they have been doing during last years to keep the interest of the new generations by means of the association they have created in this locality of Luanco. Tap on the images for a closer view.